5/11/10 – Recovered art – Paris, Musée d’Orsay – A painting was withdrawn from the Impressionist auction held at Sotheby’s New York on 3 November 2010 before the sale. 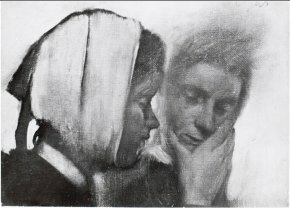 Number 142 was in fact identified a few days earlier as being the Laundry Women with Toothache by Edgar Degas (ill. 1 and 2) which had previously belonged to the Louvre (and today assigned to the Musée d’Orsay), deposited at Le Havre in 1960 where it was stolen in 1973 . It appears in the Orsay collections database=0&tx_damzoom_pi1[xmlId]=070365&tx_damzoom_pi1[back]=fr%2Fcollections%2Fcatalogue-des-oeuvres%2Fresultat-collection.html%3Fno_cache%3D1%26zsz%3D9] with a full historical background . Stolen works do sometimes resurface at auction, thus allowing them to be recovered unexpectedly. This one was not listed by Interpol, a sign that much more needs to be done here. However, it seems strange that the painting’s fraudulent origins were not pointed out before this when in fact the title  and provenance (Collection Madame Jeantaud, Paris and Collection Carle Dreyfus, Paris) were correctly identified. Carle Dreyfus, who was a curator of Objets d’Art at the Louvre, bequeathed his collection – including this Degas – to the museum in 1953. This bodes well for the Musée d’Orsay which, just barely a year ago, had a Degas pastel stolen in an exhibition (see news item of 7/1/10). We can only hope that the work’s irrefutable origin will ensure that it returns to our national heritage in a French museum. P.S. Sotheby’s today published a press release confirming that the auction house had withdrawn the painting from its Impressionist sale after having been informed on 19 October by government officials that it belonged to French public collections. We believe therefore that the Service des musées de France should act quickly to inform Interpol of all of the objects stolen in French museums, no matter how long ago. We had first stated that the theft took place in 1974 based on the Musée d’Orsay’s database. In fact, the work was indeed stolen in 1973. 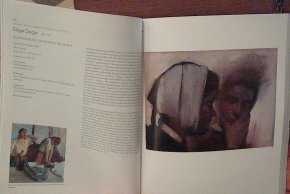 We point out however, that the painting is said to be “on cardboard” whereas the Sotheby’s catalog states clearly that it is on canvas, a mistake which is probably due to a mistaken entry or retranscription when the database was created as there is no doubt that this is the same work. With just one mistake in the plural on the Orsay database.